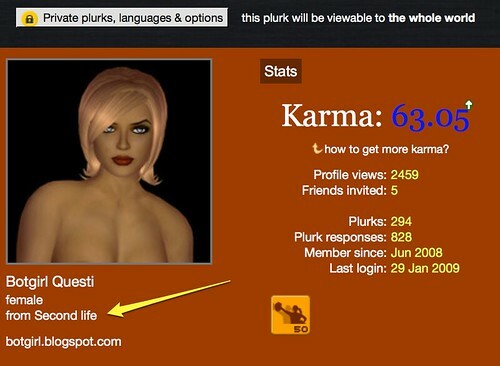 Does this foreshadow an acquisition of Plurk by Second Life or just pandering to a large avatarian population. Or is there more as ArminasX writes? Time will tell. I don't think it's anything sinister - we put in a request to plurk based on numerous discussion amongst resident plurkers. *laughs* Hmmm... just because you're not paranoid soesn't mean they AREN'T out to get you!! I don't think any scenerio I posed would be harmful or due to bad intent. My intended point was actally that there was likely no significance beyond a business decision. I was just softly being a party pooper to the idea that Plurk making SL a country on their list sognified anything about how real avatars are outside of being a market segment. grins. The original request was made so that Second Lifers could more easily find one another on plurk - there was no deeper significance re avatars being real... but I love that theory. The real reason I came back to comment was just to say I'm sad to hear you are semi-retiring from blogging - I know I'm a terribly slack reader when it comes to blogs - I tend to follow links but I do really enjoy your posts when I see/read them.